The pleasures of a fine traditional Sumatra are not quite conventional coffee pleasures. The characteristic layering of chocolate, pungent fruit and earth notes in an exceptional wet-hulled Sumatra may mildly turn off coffee drinkers who enjoy more orthodox coffee pleasures: juicier, sweeter fruit, say, or more citrus and flowers, or a suave balance with no savory earth suggestions at all. But that characteristic Sumatra layering of chocolate, sweet-tart fruit, and various expressions of earthy or tobacco-like notes constitutes a seductive and grown-up pleasure. Of the eight coffees we review this month, five are such traditional Sumatras, and three are not. The three outliers, in part, represent efforts by producers to add value to their coffees by creating new or different taste profiles through variations in fruit removal and drying. In this case, the producers aspire to create Sumatras that don’t taste like Sumatras usually do, but rather like something else, something different but hopefully just as exciting. Notch Coffee’s Boru Batak Sumatra being spread on a patio for initial drying. Courtesy of La Minita. More on those interesting outliers later. Returning to the traditional Sumatras, the main reason they taste the way they do is a uniquely Indonesian variation of conventional wet-processing called wet-hulling, or “giling basah” in local Batak languages. In wet-hulling, the soft fruit residue is removed by small producers as it is in the conventional washed or wet method, by removing the skins from the fruit, loosening the sticky fruit flesh through fermentation, then washing the loosened flesh off the beans. However, in the wet-hulling variation, the remaining moist parchment skins are removed in the middle of the drying process, when the beans still retain somewhere between 20% and 40% moisture. The beans are dried the rest of the way, to 12% or 13%, after parchment removal. The result is a mild, fortuitous mustiness that, if everything goes well, lends the best wet-hulled Sumatras their unusual depth of sensation and their complex, fruit-twisting earth notes. The key phrase in that last sentence is “if everything goes well.” Poor-quality Sumatras can come across as sharply musty rather than earthy, more like mildewed socks in the basement than fragrant fresh-turned humus. But reassuringly, the earth-invoking processing variations appear to go have gone reasonably well, in some cases superbly well, in the great majority of the traditional wet-hulled Sumatras we tested. Of the total of 75 Sumatras we cupped, more than 50 were wet-hulled. The good news for the corner café, walk-in Sumatra buyer is that all but a handful of those 50-plus wet-hulled samples rated a decent 88 and up, with 21 of them going to 90 or higher. David Pittman, co-owner of Peach Coffee Roaster, updating a roast profile. Courtesy Jeffery Emile. We review the five top-rated of those traditional-process Sumatras here, those that attracted ratings of 92 to 95. All displayed a fundamental similarity in aromatic character, dominated by earth or tobacco notes, chocolate or cocoa, and a range of pungent fruit. But beyond those commonalities, they differed. The top-rated Sumatra Lintong from Peach Coffee Roasters (95) was extraordinary in the way it ringingly amplified its tobacco and chocolate heart with exhilarating floral, citrus and sandalwood notes. By contrast, the Gracenote Sumatra Tano Batak and Notch Coffee Boru Batak, both 94, were richer, deeper, though perhaps less complex. The chocolate and the fresh earth were more explicit, the fruit more pungent and savory. All three of these impressive coffees were produced by small holders working with key collectors in the Lintong region south of Lake Toba, the best-known and most traditional of Sumatra growing regions. The other five top-rated coffees, rated from 93 to 92, were produced outside the Lintong region and displayed a considerably wider range of processing styles and grower relationships. Ibu Rahmah, Chairwoman of Ketiera Cooperative, Indonesia’s only women-led cooperative. Courtesy Barrington Coffee. The Gayo region in Aceh Province at the far northwest tip of Sumatra, surrounding Lake Tawar, produces large volumes of coffees in a variety of styles, although the most common is a wet-hulled style similar to the traditional coffees of Lintong. The Sumatra Gayo King Mandheling from Taiwan’s Fumi Coffee displayed a fine traditional wet-hulled profile, with a particularly distinct dark chocolate and a fresh, loamy earth. Barrington Coffees’ Ketiara Sumatra (92) showed still another attractive variation on the wet-hulled style, with a fresh, leafy earth nuanced by orange, cocoa and lily. The Ketiara, by the way, is produced by members of a well established, successful women-led cooperative, Koperasi Pedagang Kopi Ketiara. Finally, to the outliers, coffees processed using alternative methods to the standard Sumatra wet-hulling procedures. For example, the Paradise Sumatra Pantan Musara (93) is a conventionally washed coffee. In other words, after picking it followed the orthodox path from fruit removal immediately after picking to final drying in the parchment skin. There was no intervening removal of the wet parchment skin that would turn it into a wet-hulled coffee. Nevertheless, the Pantan Musara shows certain affinities to more traditionally processed Sumatras, such as an impressive savory depth and a sweet-tart fruit. But it shows very little chocolate and nothing much to call earth. Instead, it impresses with a big, complexly expressed ripe-tomato package of sweet, savory and tart. The practices of drying coffee in the whole fruit (natural or dry-processing), or with skin removed but with the fruit pulp still remaining on the bean (honey-processing) are now being experimented with all over the coffee world. These two processing methods have become popular ways to create alternative taste profiles to the more predictable profiles produced by the orthodox wet-processing still dominant in most fine-coffee-producing regions of the world. The curious situation in regard to Sumatra is that the standard Sumatra processing method—wet hulling—already produces sensory profiles often strikingly different from those typical elsewhere in the world. So, in effect, Sumatra producers who experiment with natural or honey methods are creating differentiation from a norm that is already different by coffee-world criteria. Leo Purba and Lisa Matthews, producers of the Giv Coffee Huta Raja Natural. Courtesy Emily Brooks, Giv Coffee. So it may not be so ironic that the highest-rated natural-processed Sumatra we tested, the Giv Coffee Huta Raja Natural (93), is, if anything, quieter and more familiar in the cup than most of the Sumatra wet-hulled coffees we reviewed. Zesty and rather brisk, with attractive dry chocolate notes, fragrant sandalwood, and fruit notes that hovered between peach and mango, the Huta Raja differed both from the chocolate-fruit-and-earth wet-hulled Sumatras we review this month, as well as from the fermenty fruit-bomb coffees many coffee drinkers have come to associate with the natural method. Among the 75 Sumatras we tested, eight were processed by the honey method, meaning the beans were dried with the fruit skins removed, but with all or some of the fruit flesh, or honey, still adhering to them. 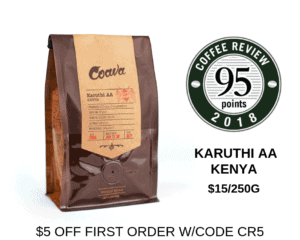 The highest-rated of these honey-processed coffees was roasted in Taiwan by Small Eyes Café: the Sumatra Aceh Gayo Mountain Kenawat Raisin Honey (93). It offers a crisp, quietly intricate cup with a distinct ripe cantaloupe note that could, with some imagination, be associated with honey-processing. Of all of the coffees we review this month, it is perhaps the most pleasingly balanced and normative in style. Regular readers of Coffee Review may notice the absence of any reference to tree variety so far in this report. The reason is that most coffee commentators assume that the main factor contributing to the unusual though consistent cup tendencies among traditional Sumatra coffees is the unique practice of wet-hulling. We look to processing method first because most Sumatra coffee is produced from a relatively undifferentiated mix of varieties, almost none of which have, so far, produced a distinctive cup in situations where they have been isolated. So, the assumption is, the distinction must come from the processing. An exception to that generalization may be the Java variety, apparently developed in around 1928 from seed sent directly to Java from Ethiopia, the botanical home of Arabica and the origin of some of the world’s most distinctive Arabica varieties, including the famous Geisha or Gesha. In Sumatra, Java is often called Abyssinia (or Adsenia), after the old name for Ethiopia. At any rate, we should not count variety out as a differentiator of the Sumatra cup. The full range of varieties grown in Sumatra has simply not been researched sufficiently to even invite speculation about their impact. Plus, producers in Sumatra, as in many places in the world, tend to be vague about the names of the trees they are growing. And those names may not be reliable anyhow, since World Coffee Research’s genetic tests of varieties in Africa and elsewhere suggest that farmers (and therefore, exporters and roasters) often are mistaken about the actual varieties planted in their fields. So, the jury is still out on the impact of variety on Sumatra’s characteristic and distinctive sensory style. Certainly many Sumatra coffee beans, particularly those from Lintong, are quite distinctive-looking. These beans tend to be elongated, often almost squarish. Occasionally (as was the case with this month’s top-rated Peach Coffee Roasters Sumatra Lintong), the beans look a bit like beans of a traditional Ethiopia type from the early 20th century called Longberry Harar—small-to-medium in size, but rather long and narrow, with a distinct center crevice. At any rate, stay tuned, both to the results of more extensive genetic study of Sumatra coffee varieties, as well to the fallout from producers’ experiments with imported processing methods that may dramatically diversify the fundamental sensory identity of the traditional Sumatra cup.